First: a list of things that are great about Grim Fandango and will always be great about Grim Fandango. Consider this an attempt to appease the angry mob congregating outside the Kotaku Australia office 30 minutes after I hit publish on this article. Grim Fandango has fantastic dialogue. To this day it remains stylish, funny, clever and real. Grim Fandango has an incredible cast of unforgettable characters. Grim Fandango's universe is beautifully drawn and well-realised. The art is dazzlingly unique. There is no game quite like Grim Fandango. There will never be a game quite like Grim Fandango. It defies genre, it defies categorization. It's too weird for this world. I consider that a good thing. I will be forever grateful it exists. Quite the list. Understandable. Grim Fandango is a legendary video game with a daunting legacy. A video game purpose built, in retrospect, for nostalgia. The Last Western. 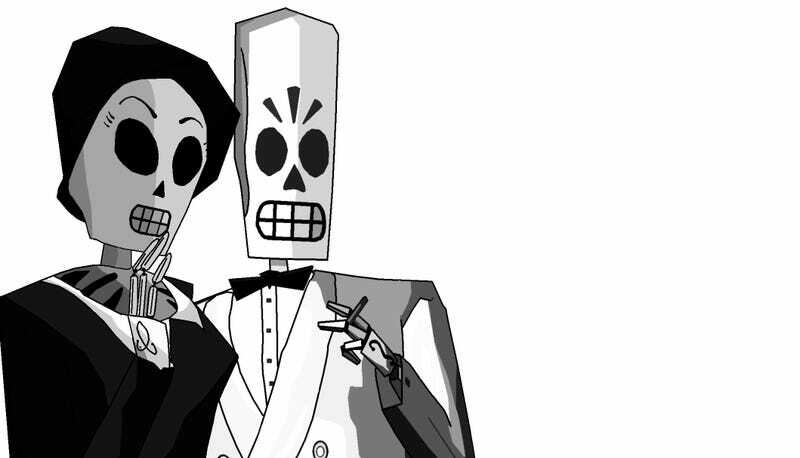 Grim Fandango exhaled a dying breath for a genre that's been on life support ever since. The graphic adventure. For men and women my age they live long and large in our collective imaginations. For us, the sharp sound of unzipped wallets is but the whiff of a Kickstarter away. We are ready to spend. We want to buy that time back. These video games are as much a part of our childhood as Star Wars, Transformers, Gremlins and The Goonies. They represent the lost spirit of adventure — not in the graphic sense, but in the real sense. They represent a moment in time. As long as we could find the right person to talk to, or the right object to use in the right situation, anything was possible. Nowadays Grim Fandango exists as a time machine. A device with the power to unlock memories you didn't even know you had. Memories outside of it. Memories inextricably hardwired to Grim in ways that none of us can fathom but can't quite forget. This is the world into which Grim Fandango Remastered has been released. How can you not love it? How can you not embrace it like a long-lost family member, cradle it in your arms, and rock yourself into a nostalgic stupor? I am thinking about these things. I'm thinking about these things because I am currently playing Grim Fandango Remastered. I am playing it and every step of the way I'm feeling frustration. If Grim Fandango was any other game I'd have stopped playing hours ago. Grim Fandango has aged terribly, but so have we. Actually, rewind. Grim Fandango was flawed from the very start. In 1998 Grim felt clunky compared to its peers. Grim Fandango was one of the first Graphic Adventures since Maniac Mansion to not actually use the point and click system. In that respect it was something of a failed experiment. Grim was one of the first graphic adventure games to give the player direct control over its protagonist. Perhaps the most high profile game to abandon the pixel hunt. Players weren't searching with a mouse pointer, they were walking around the environment, praying that Manny Calavera's head would arch slightly in the direction of an item they could use or interact with. Nostalgia aside, it was not an efficient system. In the moments of frustrations that are inevitable in adventure games of this type, it was flat out offensive. I spent many hours in 1998 scouring environments bashing the interact key in the hope that I would find something to work with. The precision of a mouse pointer, the consistency of it, was lost. In its place a system where the player was never entirely sure if they had missed something, never 100% certain they were about to interact with the correct item. In a genre where eliminating possibilities is a huge part of progression, it was irritating. It didn't work. It was a clash of styles. It had the obtuse puzzles of a Lucasarts classic, paired with a control system that made them almost impossible to parse. And let's not even discuss that inventory system. Even back then I remember thinking, 'this doesn't work', but I played through regardless. It was change for the sake of change. There was a desperation to it. Grim Fandango was born into its own context, it was cruelly self-aware: an elegy for a genre that was in the slow process of dying. A game in which every character is a skeleton. A game in which everyone is already dead. Playing Grim Fandango today feels strange. It's obtuse, clumsy, yet oddly compelling: like attending your own funeral. It's not the game you remember, but when you peel back the wrinkles on your skin its very much is the game you remember. Grim Fandango is the crow's feet on your face, the dull ache at the base of your back. It's the male pattern baldness in your genetics. You were born like this.